Walk across the boardwalk and you're on the beach. Take a dip in the spa that rests next to the dunes. Spacious residences come with scenic floor-to-ceiling windows. You're right across from a beautiful white sand beach. 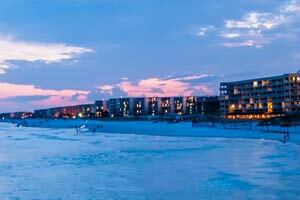 Rising 19 stories above beautiful Navarre Beach, Caribbean Resort Condo offers panoramic views of the Gulf. Relax by the pool and gaze off at the sea or slip into the hot tub for something soothing. Pick up groceries nearby and fire up the resort’s charcoal grills for a family BBQ. All condo residences feature full kitchens, living rooms, dining areas, and outdoor balconies. The resort offers free parking, and an airport shuttle for a small fee. - Check-in for this property is based at Resort Quest Navarre Beach Office, located at 8478 Gulf Blvd, Navarre Beach, FL, 32561. - The office is open from 9:00 AM-5:00 PM. Guests that are planning to arrive late must use a phone located outside of Navarre Beach Office to receive after hours check-in instructions. For more details, please contact the office using the information on the reservation confirmation received after booking.